I confess to being a “dumbwatch” owner. More specifically, it's a Pulsar solar with luminous hands and plenty of sentimental value attached to it. Though it does little more than tell me the time of day and the date of the month, I can't imagine ever getting rid of it. But what are people like me to do if access to the array of functions a smartwatch can offer becomes desirable, or necessary? That's where the Chronos comes in, a tiny device that can elevate the dumbwatch to new, smarter levels. 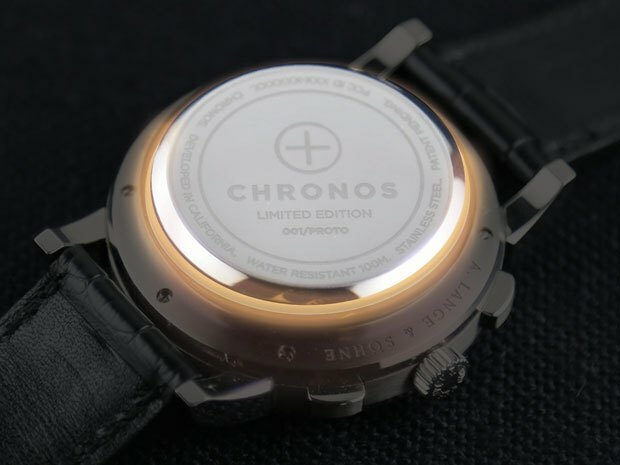 The Chronos is a small disk, using “micro-suction” to connect to the underside of a watch face, where there's little of consequence aside from the watch's serial number, among other things. But once that disk is under the watch face, it can offer up a series of notifications via blinking LEDs, as well as via vibrations, turning the standard watch into a kind of smartwatch. Plus, it even allows for easy activation by tapping the watch face itself, even though the watch face itself does nothing more than it ever did with the Chronos in place. Interestingly, the project's chief technical officer, Luke Fromowitz, had actually been involved with Samsung Electronics' Product Innovation Team before making the jump to this project, so we could see something particularly interesting come out of it as a result. Meanwhile, the Chronos can not only provide notifications, but also change music playback options or even just shut down incoming calls for those who have to be in a meeting or the like. As yet, there's no word on pricing or release dates, and the only link around seems to be just a sign-up sheet for the company's mailing list. While there will be plenty out there who decry the need for such a device—after all, why not just buy a smartwatch to begin with—there will likely be more than a few who like the watch currently in use, yet want to get just a little more functionality out of it. A simple add-on for any current watch to turn it into a smartwatch, albeit a rather low-yield smartwatch, might just prove welcome at the end of the day. It's one of the two great points of wearable tech: it not only needs to be technologically adept, providing a lot of useful, worthwhile functions in an easy-to-use fashion, but it also needs to be sufficiently stylish that it can be readily worn. A device like the Chronos, which turns most any watch from most any maker into a full-on smartwatch, certainly succeeds on the wearable, if perhaps a bit light on the tech. Still, Chronos may well be on to something here with this little disc. Letting people keep the watch currently possessed can endear potential users to a company, and this idea may well inspire other designers to take a cue and let people turn standard watches into smarter watches with a simple add-on device.